Fang-in-cheek. 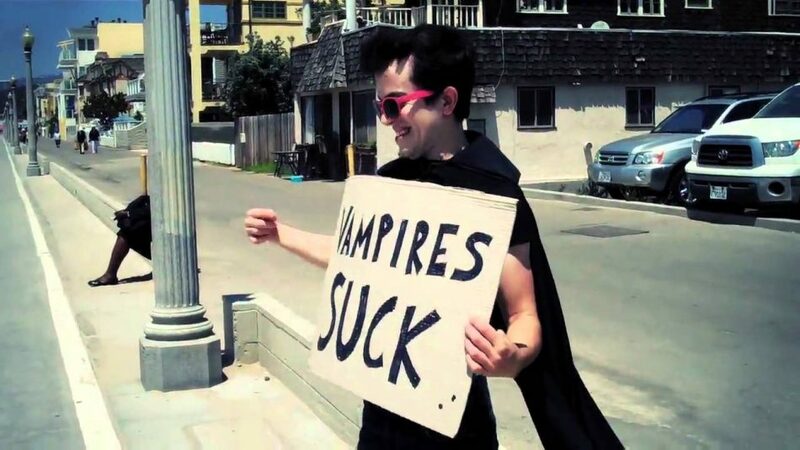 A scene from IHRTVAMPS!’s music video, “I Wanna Be a Vampire.” Picture: IHRTVAMPS!/YouTube. Halloween is almost upon us vampire fans, so I’ve decided to share some fangtastic tunes to put you in the holiday spirit. I didn’t search the depths of YouTube for just any vampire songs, I focused specifically on vampire pop parodies that appealed to my warped sense of humour and taste in music. There was no exact science behind it, just pure fun. I also included links to the original song for each entry. Make sure to check them out and you can decide which one you like better. So sit back, grab a bowl of Halloween candy, and turn it up. The Venetian Princess emerged on YouTube in 2006, but shot to fame in 2008 with her first parody, “7 Things” by Miley Cyrus. Four years later “The Vampire Song,” a parody of Katy Perry’s “Peacock”, was released on Oct. 28, 2012, just in time for Halloween. With her witty lyrics and plastic fangs, this voluptuous lady pokes fun at Twilight, The Vampire Diaries, Sesame Street, Dracula and old fashioned vampire tropes. I loved the music in this one and black and white shots mixed with goofy vampires. IHRTVAMPS! appear to be a one hit wonder. Their channel uploaded “I Wanna Be a Vampire,” a parody of “Billionaire” by Travie McCoy and Bruno Mars on Aug. 16, 2010 and nothing else has been uploaded since. The video itself was pretty cheesy, but it’s simplicity and lyrics is what appealed to me. Two random guys hang out at the beach with a guitar and jet around town in a convertible in cheap sunglasses sporting vampire vinyl capes. They sing about emo girls, immortality, True Blood, Dracula, Twilight and Count von Count. With 3,174,283 subscribers, the iJustine channel is slightly more popular than our previous artists. This quirky lady joined YouTube in 2006 and posts videos about tech gadgets, Xbox games, cooking and of course, vampires. She uploaded “VAMPIRE RAP! Eminem – Love the Way You Lie ft. Rhianna SPOOF!,” a parody of “Love the Way You Lie,” by Eminem Feat. Rihanna on Oct. 30, 2010. Again good timing for the Halloween crowd. They copied certain aspects of the original video like the wall of fire in the background and Rhianna’s catchy chorus, but missed the mark by excluding Eminem’s stylish wife-beater. Being a fan of True Blood, I found it refreshing the song placed some focus on the folks in Bon Temps, as opposed to just the Twilight franchise, which is the focus of the next couple of tracks. Count Chocula even got an honorable mention. This parody of “Last Friday Night (T.G.I.F. )” by Katy Perry is a total spoof of the Twilight franchise and shows how lovesick Bella is for Edward, desperate for him to turn her into a vampire. Having watched the Twilight movies, I found little bits quite comical. They placed Bedazzled jewels on Edward’s face to mimic his sparkly tendencies in sunlight, Bella’s character wore a Twilight t-shirt in the video and there was an “Edward Cam” that enabled you to run through the woods with this sprightly vampire. Edward even demonstrated his vegetarian vampire diet choices for his love sick girlfriend by attacking numerous animal stuffies. I saved my favourite for last. Hell, I even paid and downloaded this one on iTunes. AwesomenessTV uploaded the video on Nov. 14, 2012 and their channel has 4,338,857 subscribers. The song is a parody of “Die Young” by Ke$ha, which I never really liked as normally I’m not a fan of her work. Again this video focused on just Twilight. I really enjoyed their Edward with his constant brooding face and head bopping along to the music. He tries his best to convince Bella she doesn’t want to be a vampire, but in the end surrenders to her request and goes in for a taste. She instantly develops a cocky attitude with her new abilities, but despite her new gift of immortality, complains of boredom. They touch on the downsides of being a vampire like having seen everything on Netflix, heard all the music before, graduated high school 1,050 times and owning the iPhone thirty-one. “Katy Perry – Peacock – Parody (“The Vampire Song”),” YouTube video, 2:16, posted by VenetianPrincess, Oct. 28, 2012, accessed Oct. 25, 2016 http://youtu.be/aofyhwM1IHU. “I Wanna Be a Vampire (Parody of Billionaire by Travie McCoy & Bruno Mars),” YouTube video, 3:15, posted by IHRTVAMPS!, Aug. 16, 2010, accessed Oct. 25, 2016, https://www.youtube.com/watch?v=bL8HlK_OrwI&feature=youtu.be. “VAMPIRE RAP! Eminem – Love The Way You Lie ft. Rihanna SPOOF! iJustine and Josh Sundquist!,” YouTube video, posted by iJustine, Oct. 30, 2010, accessed Oct. 25, 2016, https://youtu.be/alXvhqE9MsI. “Katy Perry – Last Friday Night (TGIF) Official Music Video Parody/Spoof Vampire Bite Twilight,” YouTube video, posted by bambamjoey, July 12, 2011, accessed Oct. 25, 2016, http://youtu.be/Lz5DsHy8L6g. “Twilight Breaking Dawn ‘Die Young’ by Ke$ha (Official Music Video Parody) – Randomness,” YouTube video, posted by AwesomenessTV, Nov. 14, 2012, accessed Oct. 25, 2016, http://youtu.be/4U24swxrNXw. -Duran Duran, Only In Dreams.